Did you mean TPN? Or do I need to Google CPN? Thanks, I hadn't heard of Meg till yesterday when we decided to go to a movie. We picked Mission Impossible, I had no idea what Meg was about. Mission Impossible was okay...but non stop chase sceens and a confusing plot dampened my enjoyment. I think we should have chosen Meg. My boss made me give insulin to a patient who was not a diabetic. My co-workers say I shouldn't have done that. Am I in trouble? Uh oh, I didn't read the post thuroughly... I am supposed to answer the previous poster.....will All nurses ban me? I just spewed water all over my keyboard. I don't even care if this post is a troll, I love it. Honestly I thought it was going to be about patients being allergic to cats, and the poster was worried about having cat hairs on her clothing. I am so gullible. My cat even broke my cell phone, sad but true, too long a story to post here. I had to go to therapy afterwards. :(. It suddenly struck me that (mostly) conservative Christians are anti abortion. Killing an unborn child is murder. I am pro life, but at least their argument makes a little sense. Yet these (mostly) conservative Christians are pro gun ownership, support the NRA, second amendment, etc. So killing born children is somehow okay, acceptable, the price we have to pay to defend ourselves when the (fill in the blank_______________) boogy men or saboteurs or armies from a foreign country invade our home or country, our own government becoming ruled by a fascist tyrannical dictator, etc. 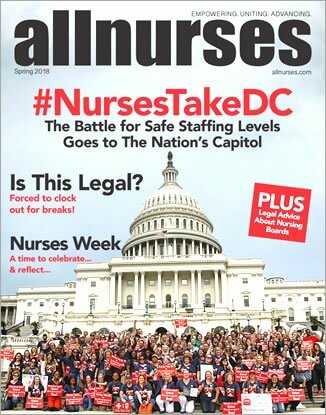 The nurse who founded Allnurses shot his family and himself. No I do not like guns. You are a provocateur. I will suggest administrators move this post to the break room under politics. You're both right. Sometimes it is not difficult to notice the difference between one spelling or grammar error in a post, versus English as a second language, versus just plain bad grammar and spelling. Thanks, it was some arthritis in his left knee and (I have to ask the Vet about this) I think the Vet said he had an extra bone in his lower left lumbar area that could be a sore area if bumped. My husband was with me and kept interrupting....I couldn't get a word in edgewise! But he was fine two days after the incident and the vet said just give him some Rimadyl PRN. Yesterday he and our other dog were playing so ruff, started running around the couch about 100 miles an hour. Later that night he was suddenly panting a lot. I thought it might be from pain and gave him a pill, but otherwise he has been fine. Today we took a walk, about 4 houses away from our house he took a hold of the slack in his leash, while I was still holding it, I let go, and he "walked" himself home. What a nut! We adopted a 6 year old pit bull. His name is Bodhi, as in enlightened one. (We didn't pick the name, but it is a good one.) He is the first dog we've owned who buries bones! He buries them in the mud/mulch in the back yard. He digs up the bone a few hours later and brings his black covered with mud bone in the house. Yay, the drought is finally over in California. :roflmao: When we put his leash on him, before we hold the other end, he picks up the leash in his mouth, and walks himself around the house? He will even pick up our other pit bull's leash and walk her around the house. I don't think she is amused. He had a very slight hard to notice limp in his rear left leg. The vet wasn't concerned, asked if he could run okay, didn't order further treatment. Unfortunately last Thursday his back left side got bumped and he could barely put weight on that leg for 24 hours. Return visit to the vet and he's getting x-rayed in 3 days. The vet said no walks until we find out what is wrong, so I am "forced" to sit on the couch with him while the other dog gets a walk, plus just sit with him to give him a little TLC. He loves to sit and snuggle on the couch while I read, watch TV, or feed my Allnurses addiction! I have never seen or used an epi pen. With all the articles about them, (my local paper ran an article about a mechanical engineer who took the injector apart piece by piece and posited that it would/should cost less than $10.00 to produce the pen), so now I am having nightmares about them! Last night I dreamed I had to draw up epi so the anesthesiologists could give it. It wasn't even an emergency, we were at a party and it was just a routine medication someone needed. I swear the dream lasted hours....I was sitting at a card table and it was littered with discarded injector pens and even "normal" syringes, needles, and ampules of epi that I had been unable to prepare. The needles kept falling off the syringe, I pricked my finger with the needle, the injector pens kept falling apart. The anesthesiologists was nice about it, he waited a while, then said to come and get him when the medication was ready! I never did get any drawn up. Am I the only one who wakes up with a headache when I have nightmares? What comes first, the headache then a bad dream, or a bad dream causes a headache? My adult daughter and 11 year old grandson live with my husband and I. My daughter has minor mental health and physical issues, but works, eats well, goes to the gym, etc. She can be normal, socially appropriate at work (I assume) but at home she is not very communicative with us! Today she, grandson, and grandson's friend, were all home. It was kind of quiet, I wandered out to see what grandson and friend were doing, to see if they or their mom had any plans for the afternoon. And they were all gone! I ASSUME maybe she just took them to lunch???? But isn't that kind of rude to just leave without saying anything? She has left like this several times with and without grandson. It seems so obviously rude to me that I find it hard to explain to her why I think it is rude. I'm not trying to keep track of her. It just seems like common courtesy when you live in a house with various people to say..."I'm doing some errands, be right back." "I have an appt., be back in about an hour." "I'm taking the boys to lunch, maybe a movie after." etc. Well....got it off my chest. Now how should I approach her to let her know we're not keeping track of her movements, it is just good manners to say "I'm going now." I caught the tail end of an interview with the former Chief of Police for Seattle, WA. He said (I forget the exact numbers and am poorly re-wording it) but something along the lines of police recruits get 60 hours of weapons training and 8 hours on crisis intervention/deescalating/defusing situations. My husband is a conservative, former Marine, and former psychiatric social worker. He knew personally of a mentally ill client killed by the police, he agrees police are shooting to kill to frequently. I mentioned the Chief's comment, he said, "They probably slept through that 8 hour class!" My husband sees his doctor often and is more concerned about his health than I am about my own health. He's not a hypochondriac, but does not follow the "normal" male pattern of not seeing his doctor. Yet he has some unrealistic health/body beliefs! He walks every day, used to run every day. Goes to the gym 3 times a week. I think (?) he thinks this great physical activity he does is all he needs to do. "I exercise everyday therefore I am healthy!" He eats nothing for breakfast or lunch, eats dinner, then has desserts (yes plural) the rest of the evening! He often is tired during the day...duh maybe because he hasn't eaten anything! But the stupidest is he had hemorrhoids, had surgery about 5 years ago. He has some bleeding again and thinks it is from eating sharp, hard, foods......"I can't eat tortilla chips anymore they cause me to have bleeding!" (Yes he's had regular colonoscopies). Does he think these chips go through his whole GI system maintaining their crisp hard texture? I guess so? I don't even respond to that....I just say "Uh, uh, okay, no more tortilla chips." Too stupid! I was assigned a sweet potato casserole (with marshmallow topping) for Thanksgiving. I found a good, basic, (simple really...I hope), recipe. Well....simple except for dummies....it says "transfer to a greased shallow baking dish." What is best to grease the baking dish with? Cooking spray? Butter? Should I grease it a lot....medium amount....or just a little? Since we will be traveling, staying at a rental, etc. I would prefer to have it all ready to go. Bake this at my house a few days before and keep it in my freezer. But I don't know how long to defrost it to have ready for Thursday? Of course defrost in the refrigerator, but put it in the refrigerator Wed. evening? Then have the host heat it up Thursday at her house? Does that sound okay? Any idea how long the re-heat would take once we get to the host's house? I do plan to NOT add the marshmallow topping until we arrive, add them at the end as it is re-heating up.